Using the maps that we’ve looked at so far we are able to tell the general shape, direction, and distances between points on the Earth. However, these maps can’t help show us what the land actually looks like. If we want a real sense of how an area looks we have to use a topographic map. Topographic maps show us how the land actually looks by showing us the elevation. Elevation is a measurement of how high or low a point is compared to sea level. How do we show elevation on a map? Topographic maps show elevation using contour lines. Contour lines are lines that connect points of equal elevation. Every point on a contour line has the exact same elevation. For example, any point you choose on the 700m contour line in the diagram to the right has an elevation of exactly 700m. 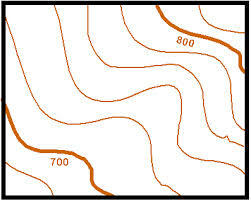 The amount of difference between each contour line is called the contour interval. In the topographic map to the right, the contour interval is 20 m. This means that each contour line is 20m different from the lines next to it. Within any topographic map the contour interval must remain constant, meaning it never changes. 1. Contour lines must connect points of the same elevation. 2. Contour lines can NOT touch each other. 3. Contour lines can NOT intersect. 4. Contour lines must be pretty, they can never have sharp points or corners. 5. 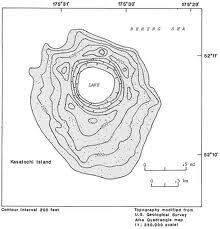 Contour lines can NOT dead-end in the middle of a map, they must form a circle or flow off the map.